“Wisdom! Let us be attentive!” In the Byzantine Divine Liturgy of St. John Chrysostom the deacon or priest makes this proclamation to the congregation before the first reading from the epistles, and again before the Gospel. St. John Chrysostom was the Patriarch of Constantinople when that city’s cathedral was the first Hagia Sophia Church, a name meaning “Holy Wisdom.” Both the name of that famous cathedral and the proclamation of the Byzantine liturgy bring out the importance of wisdom for Christians. This great respect for wisdom did not begin with Christians, by any means; the Old Testament includes a number of wisdom books: Job, Ecclesiastes, Sirach, and, of course, the book of Wisdom, and many other books, especially the Psalms, contain the wisdom of history and of the prophets. Wisdom is an important component of all of Scripture, and this is reflected in that proclamation in the Byzantine liturgy. The book of Proverbs is one of these wisdom books; indeed, it may be the model for the wisdom of Israel. It is a collection of wise teachings that was composed throughout the history of Israel, as the book indicates. For instance, the beginnings of chapters 1, 10, and 25 identify collections of instructions and proverbs that are at­tributed to Solomon. In the Bible, wisdom is frequently connected with Solomon: before dying, David addresses Solomon as “a wise man” (1 Kings 2:9); Solomon prayed that God would give him understanding so that he might be a just king, so the Lord granted him wisdom (1 Kings 3:3–14). More directly, Solomon is credited with the composition of many proverbs and songs (1 Kings 4:32). Because of his renown for wisdom, much of the book of Proverbs came to be associated with this great king. The book also mentions authors of proverbs other than Solo­mon, however: “the words of the wise” (22:17 — 24:22); “these are also sayings of the wise” (24:23–34); “the words of Agur, son of Jakeh of Massa” (30:1–33); and “the words of Lemuel, king of Massa” (31:1–9). The editors of Proverbs preserved traces of their process of collecting wisdom sayings of different people from dif­ferent periods of history, and these differences are confirmed by the different writing styles throughout the book, which are especially apparent in the original Hebrew. The collection process probably began during Solomon’s reign and continued throughout the his­tory of the Judahite monarchy and perhaps after the Babylonian exile. This makes it difficult to date any particular saying. The most reliable historical reference point is an explicit mention of the king, which probably dates a proverb to the monarchic period. Proverbs about general human experiences, however, cannot be dated with certainty. In fact, a key to the genius of wisdom is that it transcends any particular period or culture and applies to wise people throughout history. The teachers of wisdom, known as sages, mostly used two forms of speech in their teaching: the proverb and the instruction. The more common form is the proverb, which takes shape as two suc­cinct parallel phrases. The thesis of a proverb is based on experi­ence, and so anyone who examines life can confirm its truth; and it lacks explicit commands, so as to allow the readers or listeners to draw their own conclusions for their behavior. These statements are full of the anticipation of taking some action, but part of the training in wisdom is to induce the student to come to a good con­clusion on his own by taking wise action. Of course, if the student does not take the appropriate action, he remains a fool. This is one of the ways the proverbs are meant to teach us. The second form of speech is the instruction, which is typically a longer, more developed unit that seeks to motivate its hearers to action. Typically a teacher addresses the student as “my son” to establish a relational claim upon him. He often uses the impera­tive mood, commanding the student to choose the correct way of action and avoid the evil way leading to destruction. We find the instructions are collected mostly in Proverbs 1–9. 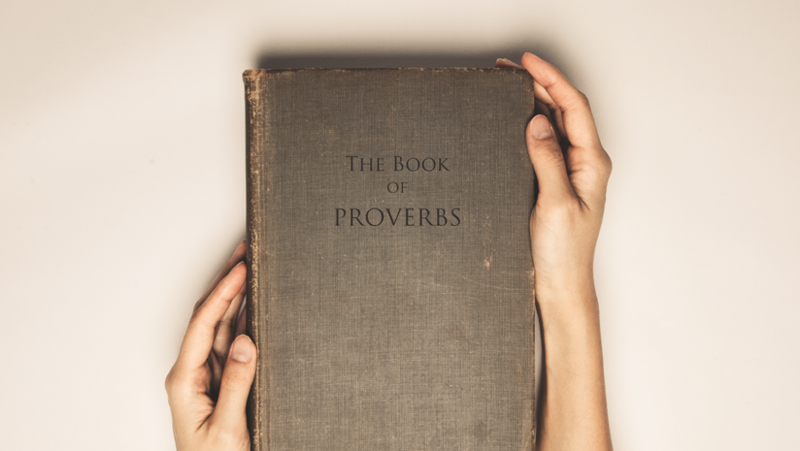 The book of Proverbs contains eight major units, based on differ­ences in forms of speech and editorial divisions. “The Proverbs of Solomon” (1–9) are a series of undat-able instructions. “The Proverbs of Solomon” (10:1–22:16) are a series of mostly antithetic proverbs. These proverbs cannot be dated, although the presence of Aramaisms, that is, Aramaic words that are included in the Hebrew text (14:34; 16:10; 18:24; 19:20; and others), may point to the period after the Babylonian exile, when Aramaic began to be spoken by the Israelites. “The Words of the Wise” (22:17–24:22) contain both proverbs and instructions. They are an Israelite adapta­tion of the Egyptian “Sayings of Amenemope,” a pha­raoh of the tenth century BC. These were translated into Hebrew and transformed by Israelite faith and mor­als. This fact requires dating these verses after Amen-emope became pharaoh, which places them during the lifetime of Solomon. The Hebrew form of these sayings may be Solomonic or from even later in the monarchic era. “These Are Also the Sayings of the Wise” (24:23–34) is a title that refers to five undatable sayings against lazi­ness and partiality in judging legal cases. “The Proverbs of Solomon Which the Men of Hezekiah King of Judah Copied” (25–29) includes two sections: chapters 25–27, mainly synthetic proverbs, and chapters 28–29, mostly antithetic proverbs. This collection may date to the reign of Hezekiah (715–689 BC). “The Words of Agur, Son of Jaqeh” (30) are mostly un-datable numerical proverbs about the mysterious God. “The Words of Lemuel, King of Massa” (31:1–9) warn a prince against women, wine, and injustice to the poor. There are no clues for dating this collection since Lem­uel is otherwise unknown. Finally, 31:10–31 is an undatable alphabetic acrostic praising the perfect wife. The acrostic device begins each line of the poem with a successive letter of the Hebrew aleph-beth (Hebrew for “alphabet”). This device cannot be translated into other languages. This book on Proverbs will examine various themes found throughout the book, since there is no thematic organization within the text itself. Although there are many fine commentaries on the Proverbs that examine each proverb in the order found in the text, it seemed more helpful to many readers to take the book themati­cally. We hope this helps you understand wisdom more deeply and motivates you to use the Proverbs more often in your daily life. Taken from The Proverbs Explained: A Blueprint for Christian Living by Fr. Mitch Pacwa with permission from the Sophia Institute.